The UAC off the Orissa coast in the Bay persists, and may move inland by Sunday morning. Associated cloudings are seen in Orissa, and adjoining Chattisgarh. Moving inland, precipitation could be expected in Orissa, Northern Coastal and Northern Interior AP, North of Vizag, and adjoining Vidarbha. Rapidly moving inland, rainfall in coastal regions will decrease by Monday, but the persistent UAC on Monday will bring rains to Northern Ap, and adjoining Vid on Monday and Tuesday. Hyderabad can expect rains on these days. SWM could advance in Vid (Nagpur) and Northern interior and coastal AP by 19th June. UAC fades away very fast within 2 days from Monday. Along the west coast, the off shore trough is getting organised from Karnataka to Kerala. Expect some moderate rainfall moving into S.I.Karnataka on Sunday and Monday. The trough will shift close to Konkan by Saturday night. North Konkan (Mumbai) can expect gusty winds and occasional showers on Sunday. Mumbai rain amount (with gusty winds)for Sunday may be around 30-35 mms. Odd heavy shower in some parts expected, and SWM advance on Sunday into Mumbai. Strong West winds will again raise the day temperatures in Chennai to over 40c on Sunday and Monday. 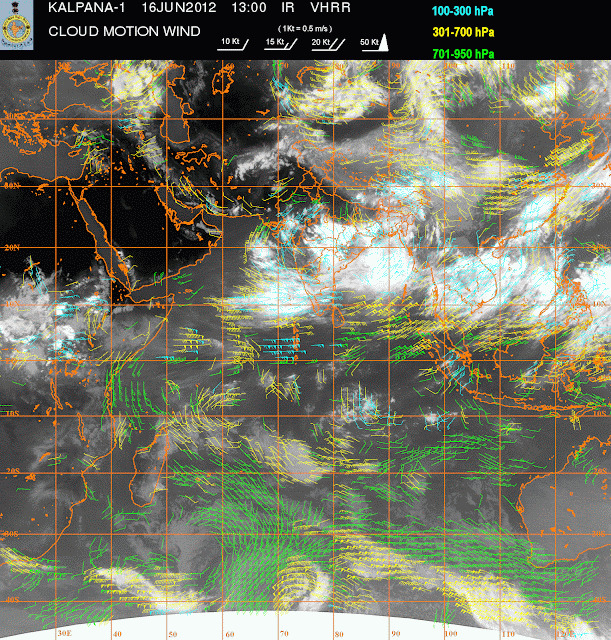 Noticing Upper Clouds in North Arabian Sea Streaming NW/SE direction ?? Puzzling ! Hope short its lived. Yes, otherwise this rain spell becomes short lived ! hope reg what ? predictions going wrong for Mumbai ? sir, when monsoon will reach srikakulam(AP). so today's GFS run is predicting heavy rainfall for Konkan coast, still sunny in Mumbai with passing showers. Sunny in Mira Road in Nort Mumbai....with passing showers. yes indeed!! i checked june 2008 IR sat images and there the high clouds are moving from WNW to ESE. SORRY!! ERROR ....I MEANT "i checked june 2008 IR sat images and there the high clouds are moving from east-northeast to west-southwest"
@rajesh first time heard thunder ths season!!!! the previous 77 mm of rain was unusually without thunder !!!! !looks like a typical monsoon onset rain!!!! do we get an update from you today ? emkay: predictions not going wrong.Its just that the cloud movement (showed again in CMV map ) going towards NW is strange. Rain spell could be short lived. roshan: as per map put up in vagaries' article MW-8, monsoon should advance into srikakulam around the 20th. If you go theu the mw-8, the UAC mentioned is active and moving inland..please keep us posted. pavan: personally i dont think much on this cloud seeding methods. Just producing 10 mms in a small patch at a cost ! How come no comments on the Mumbai lake levels ?? 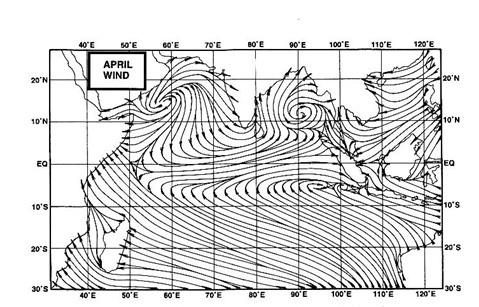 Is this wind pattern good for south interior and coastal karnataka.After long time we recied rain in bangalore. Today Badlapur city an Extended Central Suburbs of Mumbai in Thane District also received passing showers thruout the day! And also Heavier noted at 6.40pm. So can be this be said as monsoon onset! ferious thunder at panvel currently!!! Bangalore was just few drops of drizzle for only 3 minutes - this is nothing venkatesh. If does not rain Bangalore will be sitting on time bomb of no water. Imagine mind boggling population,end less high rise buildings, end less companies (IT/BPO) and BBMP,BDA no interest in lake conservation and tree plantation. The scene in Thane is thunder with heavy rain. Total rainfall for today (16th) in Thane is 29mm. Good start. panvel must have received upto 50mm today!! Sir, All persons commenting on the blog r seeing towrds sky for rains, very ridiculous human thnks abt the lakes only after he gets 944mm of rain in 24hr, many can't tolrte d rain fr even half an hour n pune if they fail then ppl cnt make out the diffrence btwn vaitarna and wankhede no one has concerns abt it same s the case n pune whch s facing severe water crisis may be worser than SSET'S place even though many people waste water like anythng, today itself n the morn i had a fight with a persön who wastd 8 buckets of water to wash his new vehicle, we require revolution in every front of life "STOP CURSING NATURE, 'PROTECT IT', IT WILL PROTECT YOU"
Here in Badlapur, Thane District too having lightening & thundery Rains with Gusty winds at times. Almost above 40mm rain should have occured today. Intermittent shower n Sun in Goregaon. Clouds moving from NW -W . Wots impact? Also I see IMD advancing monsoons to Interior Karnataka n South Maharashtra on 17. Not yet Mumbai though.